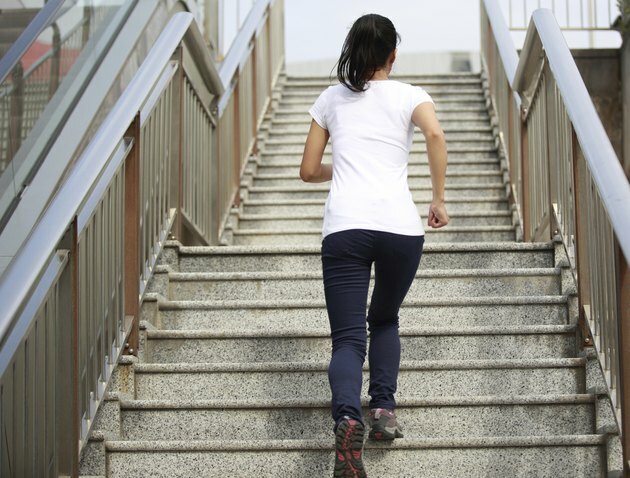 Whether you're doing it for exercise or for more practical reasons, climbing stairs is a good cardiovascular activity. It's great for toning leg muscles and getting your heart pumping. Some people may find that they experience a headache after climbing stairs. In most cases, this is of little concern.The headache typically passes soon after you stop the activity. In some cases, however, it might signal an underlying condition. The only way to determine the reason why you are experiencing headaches after climbing stairs is to see your physician. Your blood pressure is considered low when the force of blood flow against your artery walls during and after your heartbeat is lower than normal. When you stand or climb stairs, your blood pressure rises to pump more blood throughout your body, according to Stewart Tepper, author of "The Cleveland Clinic Manual of Headache Therapy." If you have low blood pressure, your body is unable to pump enough blood to adjust when you climb stairs. This can leave you with a headache because your brain is not receiving enough blood. Anemia is characterized by a decreased red blood cell count. It can also occur if your red blood cells are larger or smaller than normal. Because red blood cells carry oxygen throughout your body, your brain and other organs don't receive enough of it if you have anemia. When you exert yourself during activities such as climbing stairs, your brain and other organs require more oxygen. When your body is unable to meet this requirement, it commonly results in what is called an "exertion headache." Hypoglycemia, also known as low blood sugar, can result in having a headache after climbing stairs. Blood sugar is your body's primary fuel source. It is especially important to your brain. When your blood sugar drops too low and you climb stairs, you can experience a headache along with lightheadedness, according to Joseph Kandel, author of "The Headache Cure." This type of headache will subside when you eat something that brings your blood sugar back into a normal range, explains Kandel. Low blood pressure, anemia and hypoglycemia are the most common causes of experiencing a headache after climbing stairs. However, other causes can include poor circulation and dehydration. Your physician will generally take a detailed account of your experience to help determine the cause. Testing your blood sugar levels, red blood count and circulation can help rule out underlying conditions. Treatment depends on the cause, but in general, the prognosis is good with proper treatment. What Are the Side Effects of Low Blood Sugar? Why Do Prenatal Vitamins Give Me a Headache?